Fourthings to do that work equally well for kids and adults, because really, when it comes to Halloween, adults revert back decades, dress silly, act sillier, and generally have no shame when it comes to what happens in the darkened rooms of a Halloween party. A sign. 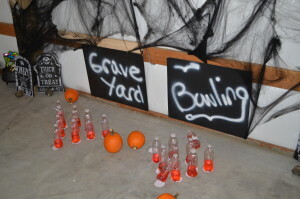 Pumpkin bowling. $3 bucks for the black cardboard. 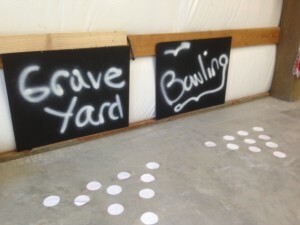 white spraypaint. tacks. old water bottles, 1/3 full of water and red food coloring (strip off the label). round, white cut outs on taped to the floor. 10 of them. Place the bottles on the floor. Behind the bottles, tack the cardboard. Walla. You are done. I was surprised how many adults wanted to play this bowling game. It was hilarious. 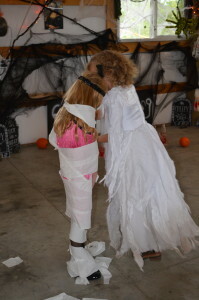 This was a party fav two years ago with the kids & the adults had so much fun I d id it again. It’s easy. Teams of 2 or 3, and two rolls of toilet paper. One package from Costco means 2 rounds of ten-give or take, so the teams of two can each hav a chance to wrap and be the mummy. This is easy, but unfortunately I don’t have pictures of the former and only one of the latter. Tossing the finger means you get a bucket (we have a cauldron) and set it about 10 feet away from the kids (in a line) and they toss 3 fingers. The one to get all three wins the prize. Adults do this to. The cauldron can be on the piano, side-stool, inside or out. You’d be surprised how few people can get the finger in (or eyeballs work) in the cauldron! The second game is awesome! This came about when I saw this Pinterest idea for earwax on a stick. I modified the idea by purchasing bones at the Spirit Halloween store (25 for $3.00). I then took a small marshmellow and stuck it on both ends of the small bones. After than, I melted Ghiradelli milk chocolate and dipped the ends in the chocolate. It looks like brown earwax…so grossly awesome. The game came about because the bones came with two small holes. I was able to run string (I used fishing line) through it, then hung the bones. The kids were able to see how many they could eat without the ear wax falling on the floor. Adults are way more grossed out on this game than the kids–no telling why. 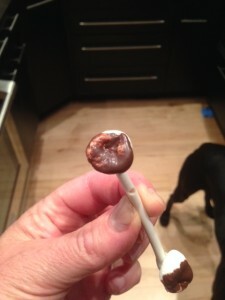 Look for the recipe and other info on the earwax which doubles as a treat in other blogs.